AccuRate, 600 series, .9 ft³ hopper and auger feed system. Capable of dispensing 48 ft³/hr – depending on materials, application, environment and machine configuration. Equipped with 17" long x 16" wide x 29" deep product hopper with (1) 8" and (1) 3" charge ports and a .9 ft³ vinyle bottom with (2) external agitation paddles. ¼HP motor drive, 1¾" diameter x 40" long screw and mounted on a Rice Lake scale. 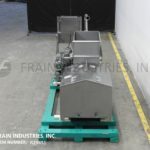 Doering, Model 3PFL, 3 ft³, stainless steel, twin screw pump feeding system. Rated from 1 to 30 gallons per minute – depending on materials, application and machine configuration. Hopper dimensions: 19½" in Length; 19½" in Width; 24" in Depth. Product viscosity: up to 1,000,000 CPS. 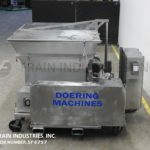 Equipped with a stainless steel product hopper, two 5½" diameter x 30" long stainless steel feeding screws and transition rotors powered by a common 3 hp drive and 2½"OD / 2"ID Tri-clamp style discharge with 13" ground clearance. Mounted on a stainless steel frame with locking casters. 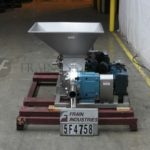 Volumetric auger feeder is capable of 360 cu ft per/hr – depending on materials and application. Mixing chamber dimensions:4′ L x 4′ W x 2′ D. Twin- agitators have interrupted flights that feed the product into a center 4" metering auger that provides uninterrupted flow of product. Carbon steel unit equipped with storage feed bin that measures 60" w x 96" L x 142" H at its widest point. 150 FT³, stainless steel, quad screw, pump feeding system. Vessel dimensions: 84" in Length; 72" in Width; 48" in Depth. Product viscocity: up to 1,000,000 CPS. Pressure rating: up to 160 psi. Equipped with a stainless steel product hopper with a powered flip top cover, four 12" diameter x 84" long stainless steel feeding screws, 10 hp drive currently geared to 4.1 revolutions per minute, 10 hp positive displacement pump, and a 4.5" Tri-Clover discharge. Mounted on a stainless steel frame with locking casters. 40 FT³, stainless steel, twin screw pump feeding system. Vessel dimensions: 48" in Length; 48" in Width; 32" in Depth. Product viscosity: up to 1,000,000 CPS. Pressure rating: up to 160 psi. Equipped with a stainless steel product hopper, two 5" diameter x 48" long stainless steel feeding screws, 5 hp variable speed drive currently geared for 10.3 to 52 revolutions per minute, 7.5 hp Waukesha 224 positive displacement pump with a 4.5" OD Tri-clover discharge currently geared for 7.3 to 37 revolutions per minute. Mounted on a stainless steel frame with locking casters. 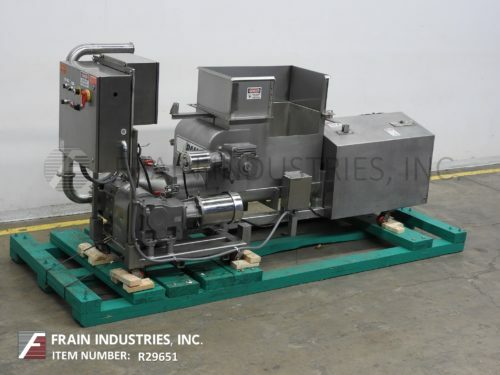 Weigh belt feeder equipped with a 27"L x 5" diameter screw auger a 17"L x 10-1/4"W infeed port with a 6-1/2" OD discharge port that feeds into a 24"L x 12"W weigh belt feeder rated at 250-1000 kg per hour. 304 S/S feeder. Equipped with 20 cuft. tapered inlet hopper, 11" diameter x 58"(L) screw, 20" OD bolt-down flanged outlet, and 7 1/2 HP drive. Flexicon, Model 1450, 4" diameter x 120" long screw conveyor. Capable of transferring up to 140 ft³ of product per hour – depending on materials, application, and product density. 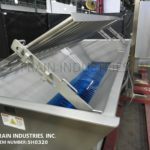 Equipped with a 36” long x 36” wide x 27” deep product hopper with grated cover, 3" diameter x 151" long stainless steel product conveying screw, 4" diameter x 120" long flexable poly tube, top 3 Hp motor drive with 6” inside diameter product discharge port. 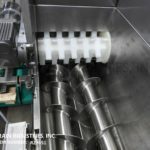 Ram Equipment Industries / Moline, jacketed, stainless steel, auger and pump feeding system with pounds of product per hour – depending on materials and application. Equipped with 18" in Length; 15-1/4" in Width; 16" in Depth, stainless steel jacketed product hopper and feed system, rated to MAWP of 150psi @ 300 Deg F and MDMT of -20 Deg F @ 150psi, with (2) 4" OD x 24" Long stainless steel feed screws powered by 1/2 Hp motor drive. Waukesha model 34 jacketed head PD pump with 2½"OD / 1-3/4"ID sanitary in feed and discharge ports with 3 Hp motor drive. Control panel has system power on, pump and auger / roller start and stop, auger foward / reverse and speed controls. Mounted on a stainless steel frame with casters. Ideal for pumping thick viscous products such as butter, shortening, heavy fillings and other difficult to pump products. Ram Industries, 8 ft³ stainless steel, auger and pump feeding system. Hopper dimensions: 36" in Length; 20" in Width; 20" in Depth. Equipped with a stainless steel product hopper, (2) 10" diameter x 54" long stainless steel feeding screws powered by a ½ hp drive with a 605:1gearbox for final revolutions of 2.8 per minute.Waukesha model 134 positive displacement pump with a 3½"OD / 3"ID Tri-clamp style discharge with a 59.38:1 gear ratio for 7.25 GPM. Stainless steel auger and pump feeding system. Hopper dimensions: 65" in Length; 32" in Width; 35" in Depth (approx 9 ft³). Equipped with a stainless steel product hopper, 5" diameter x 64" long stainless steel feeding screw powered by a 1 hp drive. 1½ Hp Waukesha model 40 positive displacement pump with a 2½"OD / 2"ID Tri-Clamp style discharge with a 29.31:1 gear ratio for __ GPM. Control cabinet with an AB controller, AB PanelView Plus 700 touch screen HMI and variable speed controls. Mounted on a stainless steel base frame with casters.